For the crust, mix all of the ingredients and place in the bottom of 9 inch spring form pan. Press down and make an even layer, going up the sides of the pan about an inch if you can, this is optional. Set the crust aside as we mix the filling. For the filling, place all of the ingredients in a bowl except for the vanilla bean. Split the vanilla bean down the middle length wise and use the back of the knife or spoon and scrap out the seeds (if you don't have fresh vanilla beans, just substitute an additional 1/2 tsp of vanilla extract). Add this to the bowl and mix with a hand mixer until everything is smooth. Pour on top of crust. Bake in a preheated 350 degree oven for 35-45 minutes. Mine was perfect after 35 minutes. You want to filling to be ever so slightly wiggly in the center. Let cool completely on a wire rack. Now, store in the fridge with plastic wrap covering until ready to serve. For the sauce, wash strawberries, cut off tops and slice in half or large chunks and pop in a blender. Add the water and powdered sugar 1Tbls at a time. Mix until it forms a smooth sauce. Taste and add the remaining sugar if needed. Depending on the time of the year, the strawberries can be more tart. So just add the powdered sugar to your taste. Blend again to mix in any additional sugar. Serve the cheesecake with the sauce on top and enjoy! 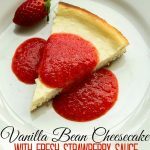 Vanilla Bean Cheesecake with Fresh Strawberry Sauce Recipe found on https://thissillygirlskitchen.com/vanilla-bean-cheesecake-fresh-strawberry-sauce/ *All nutritional information is approximate and may not be 100% accurate. Please consult a nutritionist for more specific information.